Cabled unit with Standard Radiation Shield has all the reliable features of the original unit but incorporates many additional improvements! This cabled weather station is an upgraded version of the original system. It includes 100 feet of cable running from the integrated sensor suite to the console. The system consists of a console unit and an innovative integrated sensor suite that includes a rain collector with self-emptying bucket, temperature and humidity sensors and an anemometer. The sensor suite is housed inside a standard radiation shield, protecting the sensors against solar radiation and additional sources of reflected and/or radiated heat. The passive shielding reduces outside solar radiation temperature errors. The cabled weather station uses a 4-conducter, 26AWG cable. The anemometer is detachable from the sensor suite for increased flexibility and 40 feet of additional cable is included for the relocation process. 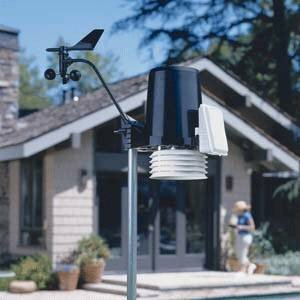 The cabled Vantage Pro2 weather station includes a solar-powered sensor array and has features such as on-screen graphing, forecasting using easy-to-read icons (sunny, cloudy, rain, snow), barometric pressure readings, inside temperature, dew point, humidity information, time and date, and much more! This cabled weather station is an affordable system perfect for the amateur weather hobbyist or aspiring weather professionals! The data display categories represent all weather variables that the console displays and are listed in alphabetical order. General describes the general ways in which data is displayed and archived for all data display categories and is listed first as a point of reference. See the individual data display categories for specific display information. Current Display Data . . . . . . . . . . . . . . . . . . . . . . . . . . . . Current display data describes the current reading for each weather variable. In most cases, the variable lists the most recently updated reading or calculation. Some current variable displays can be adjusted so there is an offset for the reading. Alarm Indication . . . . . . . . . . . . . . . . . . . . . . . . . . . . . . . Alarms sound for only 2 minutes (time alarm is always 1 minute) if operating on battery power. Alarm message is displayed in ticker as long as threshold is met or exceeded. Alarms can be silenced (but not cleared) by pressing the DONE key. Resolution and Units . . . . . . . . . . . . . . . . . . . . . . . . . . . . Measured in 0.01" Hg. Other units are converted from Hg and rounded to nearest 0.1 mm, 0.1 hPa, 0.1mb. Elevation Range . . . . . . . . . . . . . . . . . . . . . . . . . . . . . . . -1500' to +15,300' (-460 m to 4670 m). The console screen limits display of lower elevation to -999' when using feet as elevation unit. Resolution and Units . . . . . . . . . . . . . . . . . . . . . . . . . . . . Measured in 1F. Celsius is converted from Fahrenheit and rounded to the nearest 1C. Calculation Method . . . . . . . . . . . . . . . . . . . . . . . . . . . . . Measures time between successive tips of rain collector. Elapsed time greater than 15 minutes or only one tip of the rain collector constitutes a rain rate of zero. Resolution and Units . . . . . . . . . . . . . . . . . . . . . . . . Current Data: 0.1F or 1F or 0.1C or 1C.(nominal). Celsius is converted from Fahrenheit and rounded to the nearest 0.1 or 1C. Historical Graph Data and Alarms: 1F or 1C. Celsius is converted from Fahrenheit and rounded to the nearest 1C.